“I partnered with P&G and Olay to attend The Skin Cancer Foundation Gala and produce this post. As always all opinions are my own. Thanks for supporting the brands and collaborations that make NY Trendy Moms possible!" 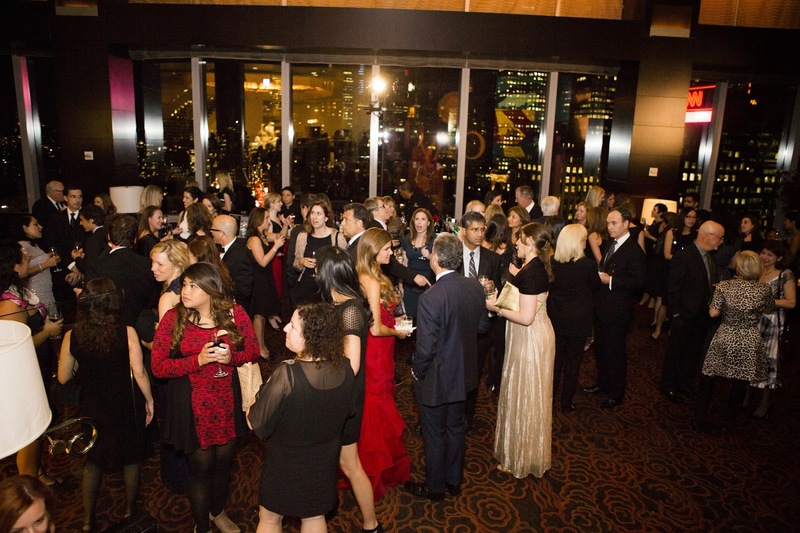 As many of you know, I was honored to attend The Skin Cancer Foundation Gala as an on-site correspondent for Olay. If you follow me on twitter you might have felt like you were at the gala itself from all my live tweets. The event was such an unforgettable experience and I am so happy I get to share every detail with you guys. From walking the red carpet to sharing an incredible room with the most influential dermatologists and celebrities in the business. It's awesome seeing how everyone came together to raise awareness and support a great cause. 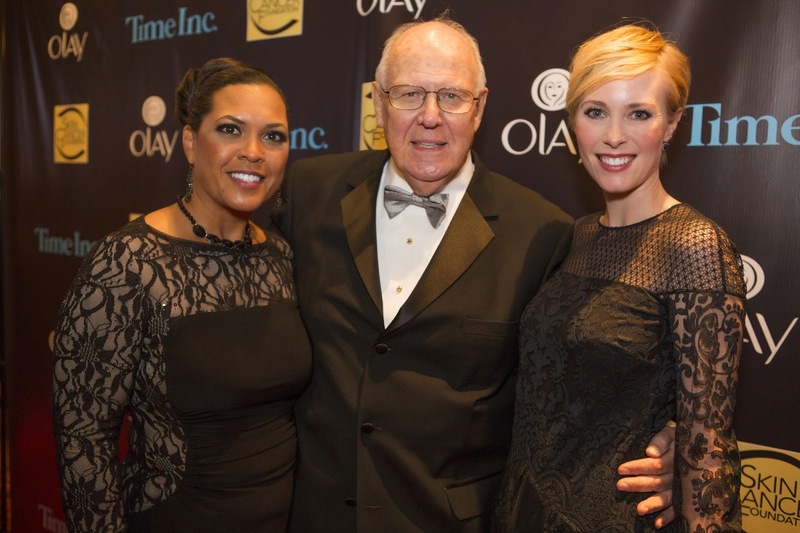 At the event, Olay was honored for their efforts around skin cancer prevention. I was privileged to be at such a prestigious event beside Lela Coffey (Brand Director, North America Olay), Hillary Fogelson (Skin cancer survivor and sun protection activist), Karen Kovacs (publisher for People Magazine) Audrey McClelland (Mom Generations) and Dr. Robins (Founder/President of the Skin Cancer Foundation). 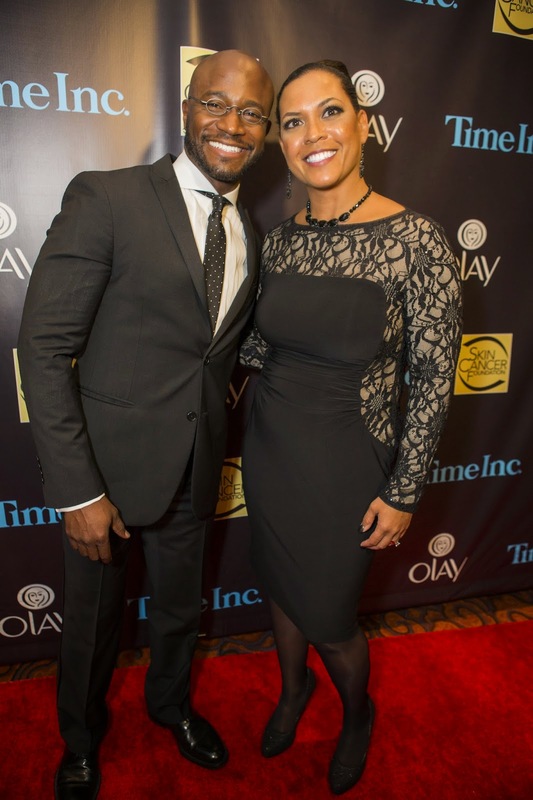 The event was held at the Mandarin Oriental hotel hosted by Taye Diggs. A few of the performers included the legendary singer-songwritter Sting, Award winning Violinist, Joshua Bell and amazing pianist, Alessio Bax. The cocktail of the evening was the Olay Glow-jito (how awesome is that name!) and dinner was delicious as expected. We had the choice of mushroom risotto or steak, I went with the risotto since I'm practicing towards becoming a vegetarian:) For those asking, I wore a beautiful peachy-pink dress by Virgos Lounge and Miriam Salat accessories. You can buy the dress here and accessories here + here. Many women have not been thoroughly educated on the importance of applying SPF every day, let alone how easy it is to work into their existing beauty regimen. To solve this, Olay launched a campaign to educate women about the importance of wearing a facial moisturizer with a minimum SPF 15 every day. Olay is helping women understand that sun protection does not have to be complicated it just has to be consistent. Olay introduced Total Effects SPF 15 and SPF 30 to provide women with skincare products to help them look their best beautiful every day. Can you believe Skin cancer is the most common form of cancer in the United States. More than 5 million cases of skin cancer are treated every year. Women shouldn’t have to choose between beauty and UV protection. Olay sun offerings feature SolaSheer Technology, which combines broad spectrum SPF protection with proven moisturizing agents to keep skin protected and allow women to put their best face forward. The event was a success and I want to thank the Olay team for making this happen.